(Steve Griffin | Tribune file photo) UTA's new long "BRT" (bus rapid transit) is parked in front of the Capitol during Transit Day on Capitol Hill in Salt Lake City Friday, Feb. 2, 2018. The House voted Friday to strip power from the Utah Transit Authority to decide how it spends increased sales tax for transit that voters in Weber, Davis and Tooele counties approved in 2015. HB339 passed on a 65-0 vote, and is headed to the Senate. It resulted from Weber County mayors contending that UTA is ignoring how they want to spend those increased taxes. Mayors have said they want to see the majority of Prop 1 money used to fund a bus rapid transit project from downtown Ogden to Weber State University — but most money has gone to improve bus stops and service. UTA officials said earlier they support that BRT project, but are trying to figure out how to fund it. The bill leaves “to the locals to say what, and where should we spend our local tax dollars,” said Froerer, who has said he plans to run for the Weber County Commission. 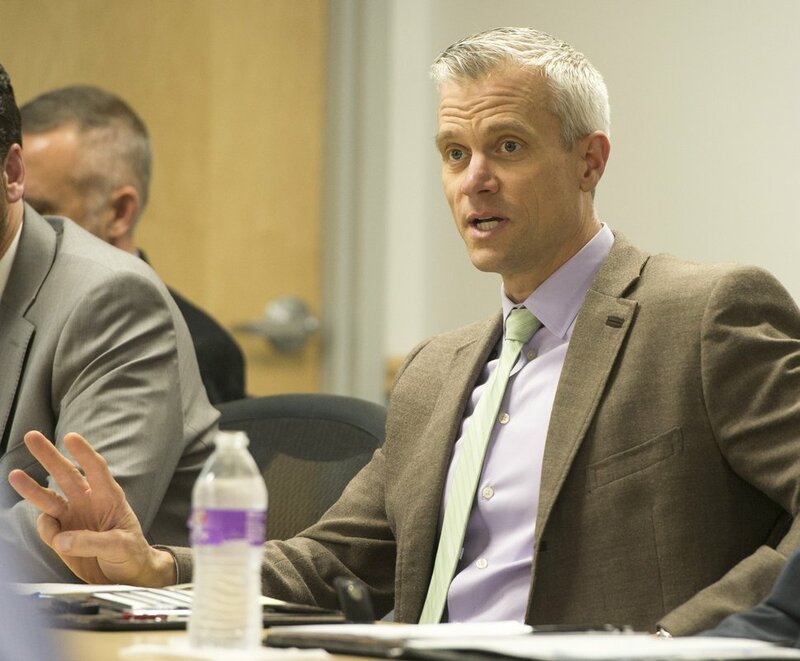 Weber County mayors say that the Utah Transit Authority is ignoring how they want to spend increased sales taxes for transit and roads that local voters approved in 2015. So the city leaders persuaded lawmakers on Tuesday to take a first step to give them — not UTA — direct power over how to allocate that money in the future. The House Political Subdivisions Committee voted 8-1 to approve HB339 and sent it to the full House for consideration. Rep. Gage Froerer, R-Huntsville, sponsor of the bill, said state law allows local mayors and county commissioners to develop a priority list for how they want to use higher transit taxes from 2015’s Proposition 1. He said the Weber County Council of Governments did that, but UTA so far has ignored it. 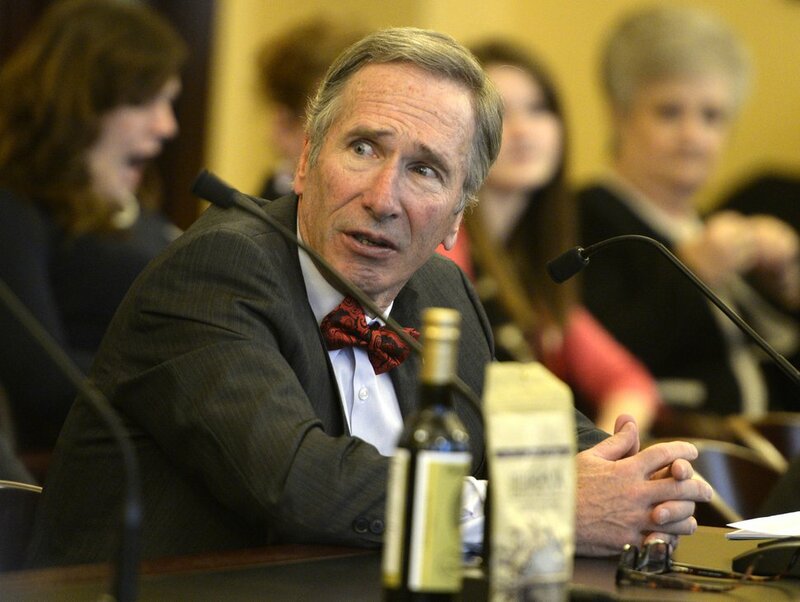 Rick Egan | The Salt Lake Tribune Rep Gage Froerer talks to the Senate Health and Human Services Committee about HB0105S07 Plant Extract Amendments, allowing cannabis oil for the treatment of seizures, Thursday, March 6, 2014. Toby Mileski, former mayor of Pleasant View who was just appointed to the UTA Board, said UTA has used Prop 1 money so far in Weber County for such things as improving bus stops and increasing some bus service. But he said most Weber County mayors “would like to see the majority of the Prop 1 funds used for and fund a BRT [bus rapid transit] project in Ogden” from its downtown to Weber State University. A BRT is sometimes called a “TRAX on rubber wheels” with its own road lanes, extra-long buses with multiple doors, limited stops and ticket machines for rapid service. That “would greatly economically benefit the county,” Mileski argued. The bill would require UTA to follow the priority lists developed by local public officials in counties that have passed Prop 1. Within the UTA service area, counties that passed Prop 1 are Weber, Davis and Tooele. Salt Lake, Utah and Box Elder counties rejected it, largely over concerns about scandals at UTA. Rick Egan | The Salt Lake Tribune Matt Sibul, chief planning officer for Utah Transit Authority, talks about Proposition 1, as the UTA board meets in a committee meeting, Wednesday, Nov. 4, 2015. In the meantime, he said the community has been pushing hard for expanded bus service — and UTA is trying to provide more with Prop 1 money, even if mayors want the BRT more. “We continue, I guess the best term is, to negotiate with policymakers on how funding can come together from all sorts of sources for that bus rapid transit project, and we’ll continue to collaborate as we always have done,” Sibul said. The bill would essentially end negotiations and order UTA to do what mayors want. The bill comes as legislators are proposing much more drastic changes designed to restore trust in the scandal-scarred UTA. That includes a proposal to replace its current part-time, 16-member board with a full-time, three-member commission designed to better oversee UTA executives.